We made our way to Monterey, CA the day before the race. 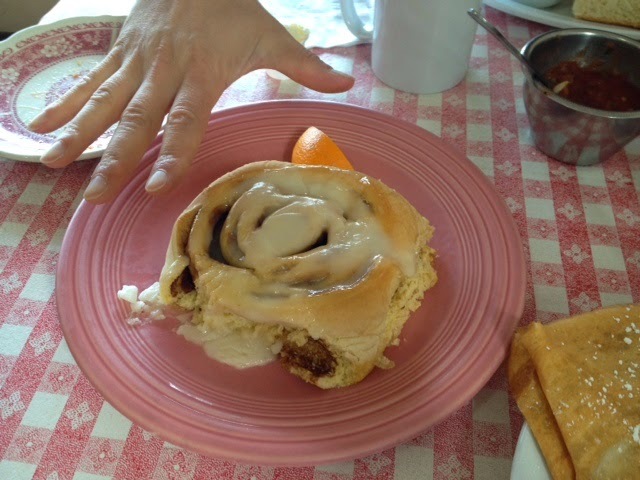 We woke up at 4 AM and started our trek, stopping around the Buellton area at Ellen's Danish Pancake House. 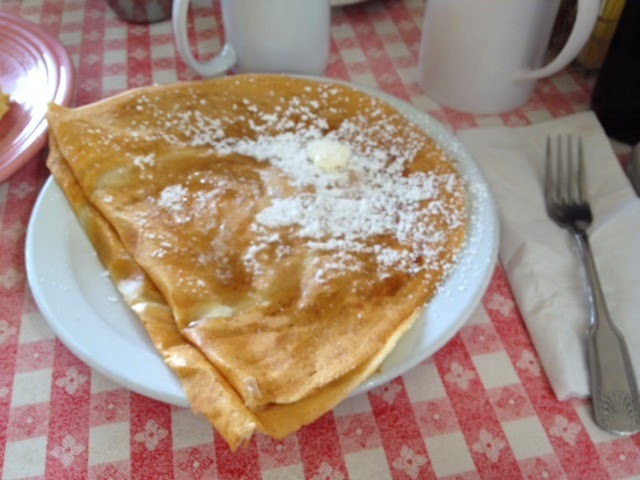 I had never had Danish pancakes, which were pretty much very thin regular pancakes. Although I didn't want to get anything else, "The Ukrainian" demanded that I at least get an egg, so I decided to raise him a cinnamon bun. We got the expo around noon and were kind of disappointed about a couple of things. First, parking -- there wasn't much of it in the area, and we also ended up getting a parking ticket. Knowing this was an event weekend, there should have been more of it, or more leniency in the process. Second, the expo was packed with cliques (super athletes, wine buddies, etc. 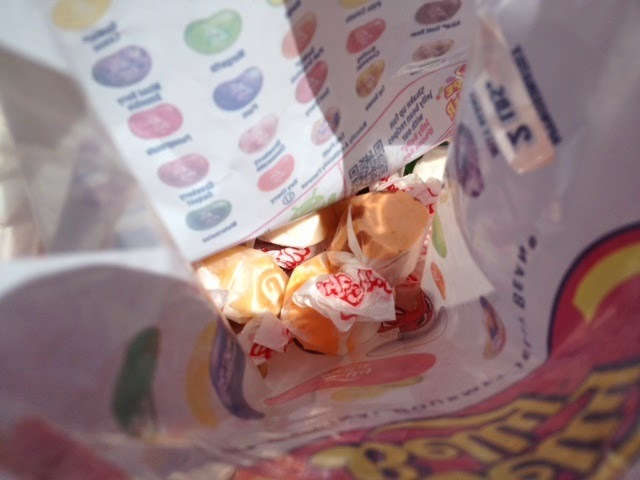 ), and there weren't really any samples. 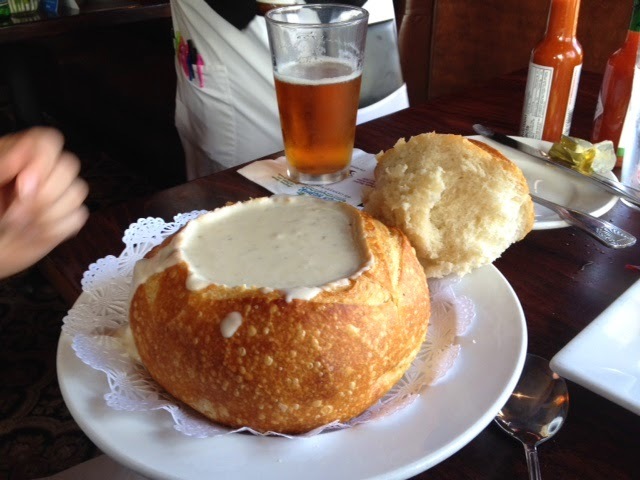 We decided to walk around the Old Fisherman's Wharf and comfort ourselves with food. 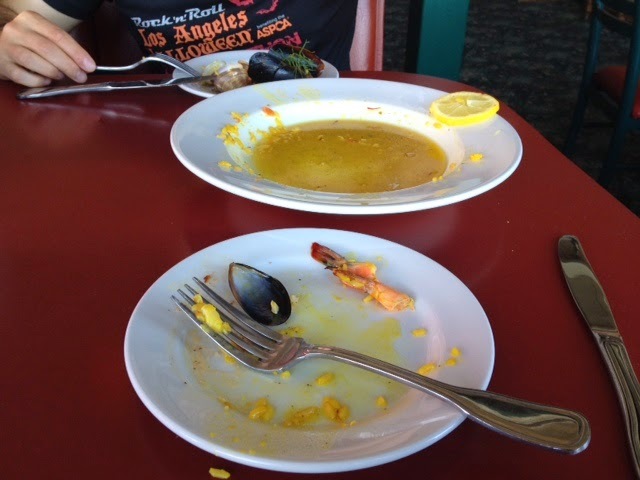 Shared paella by the water. Was so tired from the wind that I forgot to take a "before" shot. After checking into our hotel and taking a catnap (because we woke up too early), we headed to dinner at the local mall. 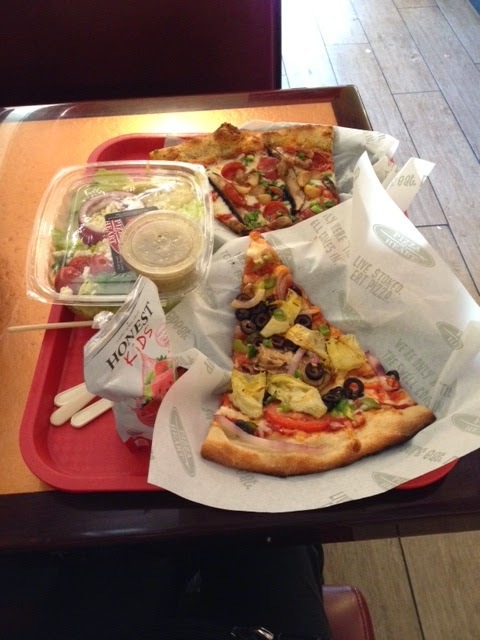 There was a pizza-by-the-slice place that seemed to suit our pre-race needs. Yep, drinking a kiddie drink here. 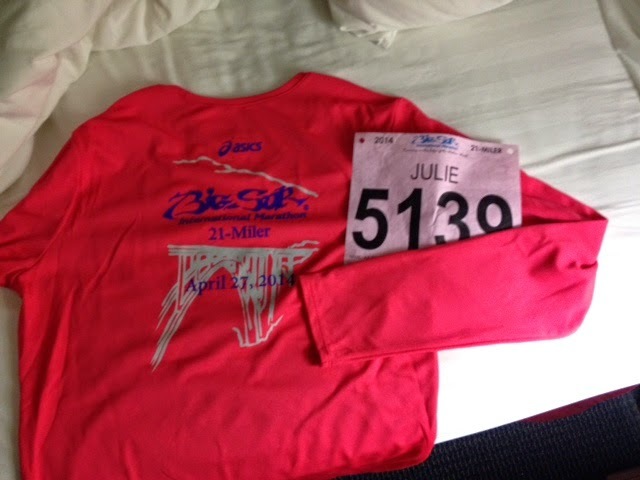 Back of the race shirt. The next morning, we woke up at 3 AM (i.e., very early) to get ready before heading to the buses. The marathon and 21-miler had different buses, so "The Ukrainian" and I parted at this point. It took about an hour to get to the start, winding around in the dark. I guess I'm glad it was dark, since everything was still a surprise when I was to run the distance myself, but I did get a bit nauseated from that. When I arrived at the starting area, I used the port-a-potty and then was sad when everyone already ate all the bagels. Really?! Luckily, I was able to snack on some banana and a trail mix bar I had in my backpack. Yes, I decided to run with a backpack, as I knew I needed to bring fuel with me. 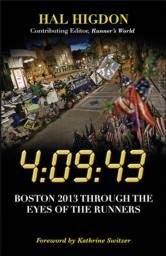 As the sun rose and the race was about to begin, I, wearing my sister's Boston Marathon 2013 shirt, got a little emotional as the national anthem was being performed. Then, we took off. The 21-mile course (it's actually 21.6 miles) begins around the Mile 5 point of the marathon. It started off on an incline (and I think some elevation might have gotten to me?? ), and I think that's when I decided to stick to my "taking it easy" guns. Here are some pictures I was taking along the way. I stopped taking them pretty quickly, because around five miles in, my fingers were swollen like sausages. I have no idea why this happened so early, as I was definitely hydrating at every station and topping off in terms of electrolytes (I think I stopped for the bathroom five times). It became kind of painful to hold my phone, so I put it away for the rest of the race and enjoyed the views with my eyes instead of my phone. I ran/walked until we passed the tough Hurricane Point area (around Mile 13). "The Ukrainian" passed me around Mile 11 (Mile 16 for him), and he unloaded his gloves into my backpack as we walked up an incline and complained about the difficulty of it all. 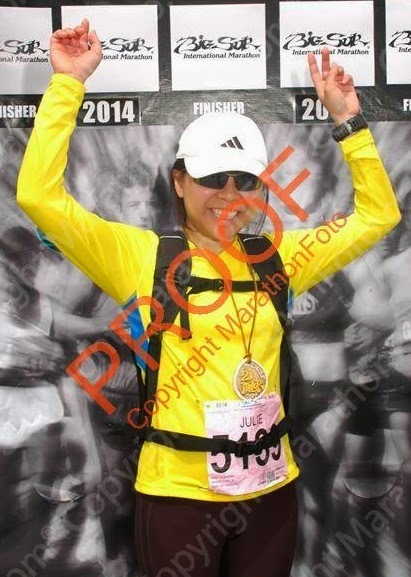 So here are some of my race pictures. I look tired in most of them, and they are quite representative. The course was obviously beautiful and worth experiencing, but for the under-trained, and even for the trained, it is certainly no joke. Also, I think by going more slowly, it just made the whole thing so much longer. Overall, my legs felt as swollen as my fingers, so even walking was kind of painful, and I was clocking 18-minute miles at some points. I somewhat worried that I wouldn't make the 6.5-hr cutoff, which has never quite been a concern for me before. I likened it to a really, really long hike. Luckily, there were many people out there just kind of walking along, just trying to finish, so I definitely wasn't alone in this at all. A few people asked about my Boston Marathon shirt, which I said was my sister's, and they continued on, hah. So tired I could barely hold up my arms here. Was slumped over in the previous pic. As a slower person, I was trying my best to stay as left as possible (per instructions), but a few runners decided to nearly ram into me, anyway, weaving around me. Also, the far left was also very slant-y, which caused more foot/hip pain. I did feel like the 21-milers were kind of regarded as "less than" the marathoners, but I do understand the logistical reasons for this. My Garmin died without a low-battery warning when I had less than half a mile to go (again, very representative). That last climb before the end was soul-crushing, and I imagine it would have been worse running. 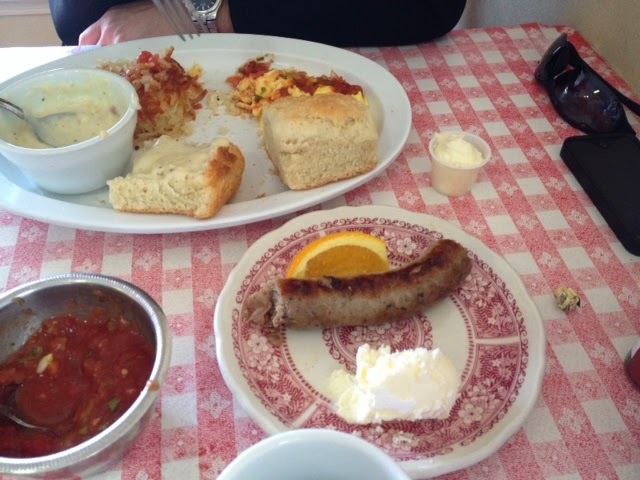 When I finally crossed, I could barely make my way anywhere, though scarfing down a small apple, a bagel, and a bran muffin in five minutes certainly helped. 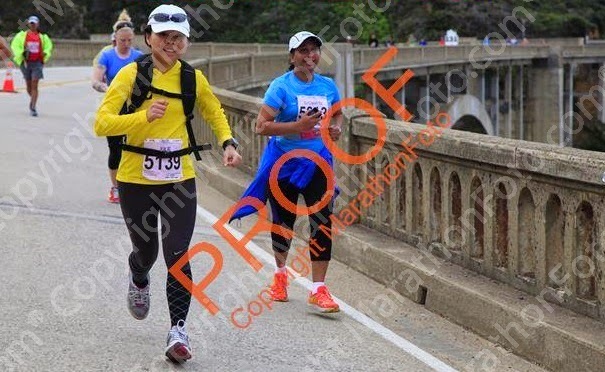 I would definitely recommend Big Sur as a "to do" race, even the 21-miler, which will still feel pretty much like a marathon depending on how you deal with hills/altitude like me. 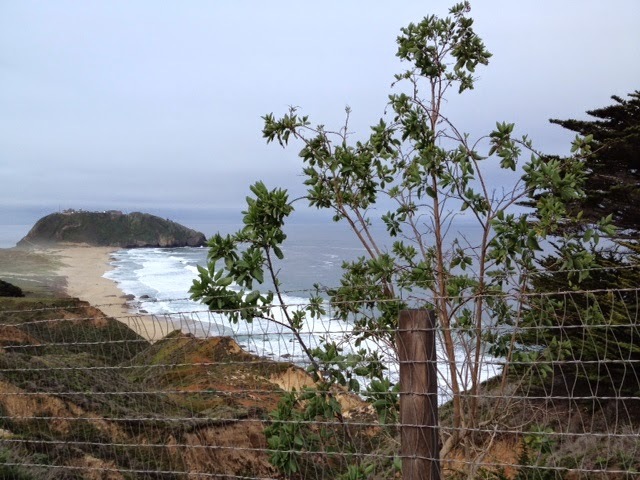 The views can't be beat, and it was nice to run without music and hear the waves crash and cows moo. 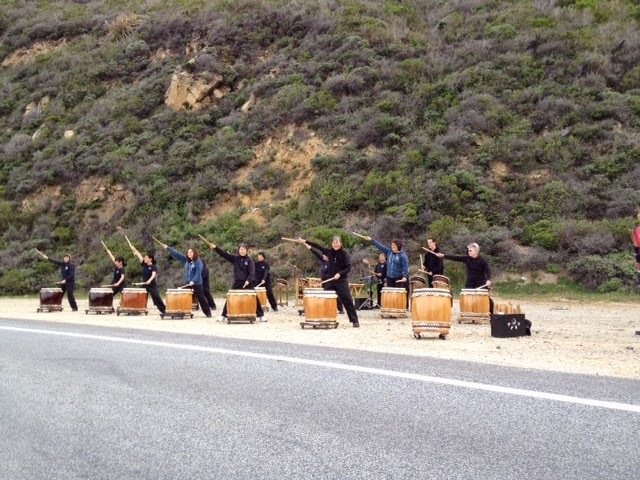 The performers were great, too. Hearing the twinkle of a piano echoing in the mountains in the distance was so mystical. Also, the most delicious strawberries after Mile 23 were pretty much the best things, ever. 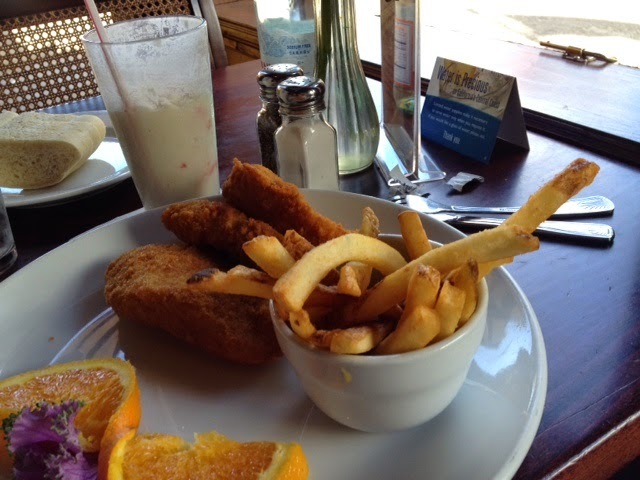 Beefiest fish 'n chips ever. 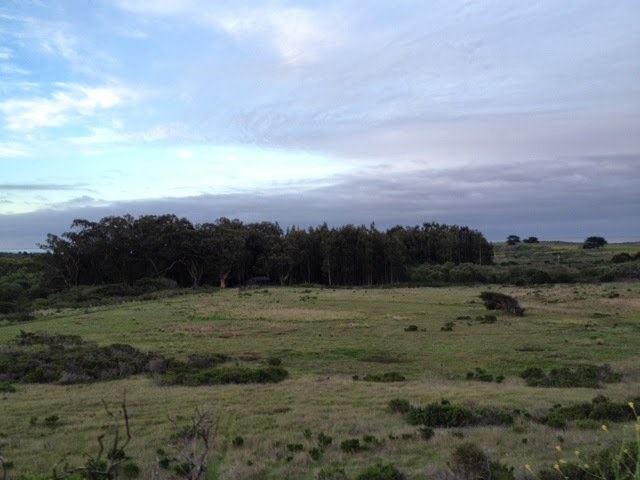 Oh, and it was my first time in the Monterey area. It was beautiful, and I hope to return sometime soon! 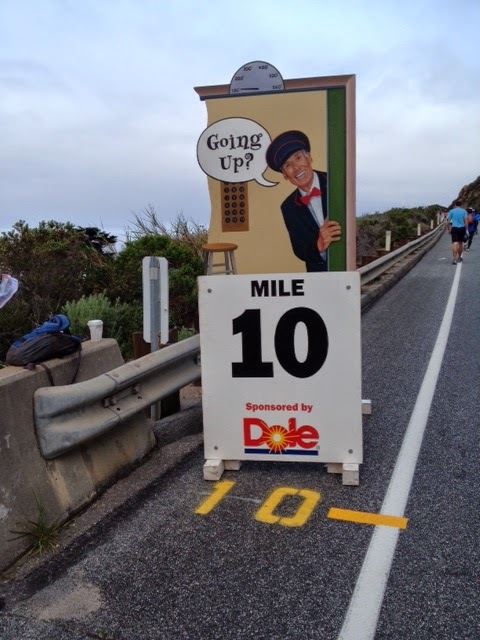 After what has seemed like an eternity, I will be in Monterey in about 10 days for the Big Sur Marathon! 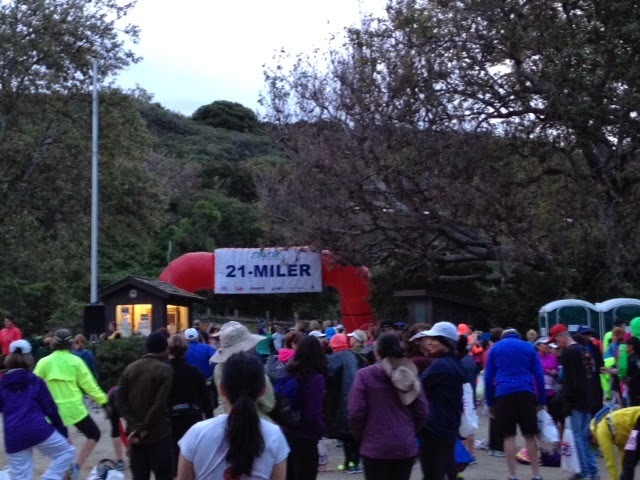 Registration for the Big Sur races opened on July 15th, a Monday morning, at 7 AM. "The Ukrainian" was at work and registered at that time, while I was at the gym before work. I got to my desk around 8 AM and immediately went on to register. The "Marathon" button was greyed out. Surely, this must be a mistake? Some seconds later, I realized that it had sold out. Argh! Prior to that day, I had been having some reservations about registering for the full marathon. I was perfectly content rounding out at 15 and backing off since I was having trouble sticking to a regular training schedule. I guess the quick sell-out (59 minutes!) made the decision for me. (I guess had I been prudent, I would have asked my love to register for me, but obviously I did not anticipate this issue occurring -- I read that next year, they will have a different entry procedure, so glad that I'm in for this year's!). One of my lunchtime doodles -- okay, I was on a phone interview during the time. I will still be at this race, starting at the 5-mile point. 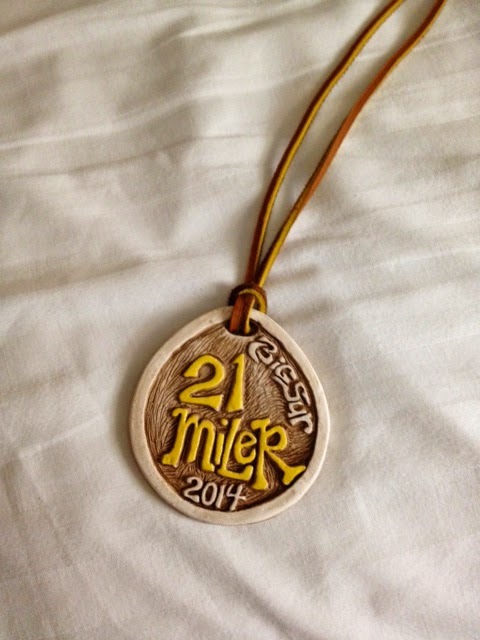 Yes, that's a 21-miler, folks. Auto PR!! This gives me enough slack to run/walk this race, since I am desperately under-trained and wouldn't mind just enjoying the scenery. I plan on carrying food, water and my phone with me. Yep, it will be THAT kind of race. And that kind of makes me look forward to it. If anything, I am severely burnt out from not taking time off of work since November (I am taking a FULL DAY off after the weekend for this, whoop whoop! [slight sarcasm]). In the meantime, I'm turning 29 in a couple of days. My birthday always sneaks up on me these days, and somehow, the prospect of this one is not giving me the "omg, I'm so old" feelings that I used to get. This could be because I have spent the last few years feeling this way, and well, nothing has changed. Still, I think this year (as a precursor to my 30s) will be defining in its own right. Wow, I have been MIA for a bit. I think the overarching reason is due to my lack of running. Folks, it has been pretty bad. I've maybe run 3.5 (yes, that .5 matters!) miles in the past month. I could make a ton of excuses, but besides working overtime and such, the fact that I haven't been sleeping well has made weekend running pretty much the lowest of my priorities. The funny thing is, I had a similar slump this time last year, so I hope things will be on the uptick again soon. 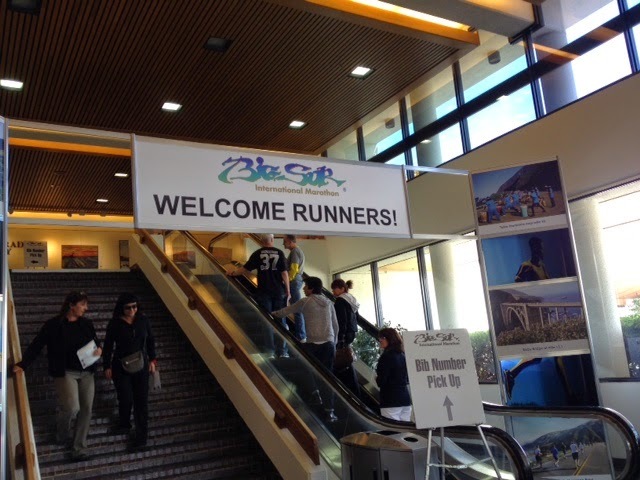 The Big Sur International Marathon and related events are less than four weeks away. Race Weekend Instructions are now available HERE. They contain event-specific instructions as well as general information about race weekend. We strongly encourage you to read these carefully so that you will be prepared for your race. In other news, I pretty much can take from my post from last year that I'm planting herbs and baking bread in my spare time. Oh, and someone just lent us Season 2 of Game of Thrones. Yes, I am THAT behind! I also have a new nephew who is the highlight of my weekends. I have a few posts lined up for the coming weeks, so hopefully some people are still staying tuned. 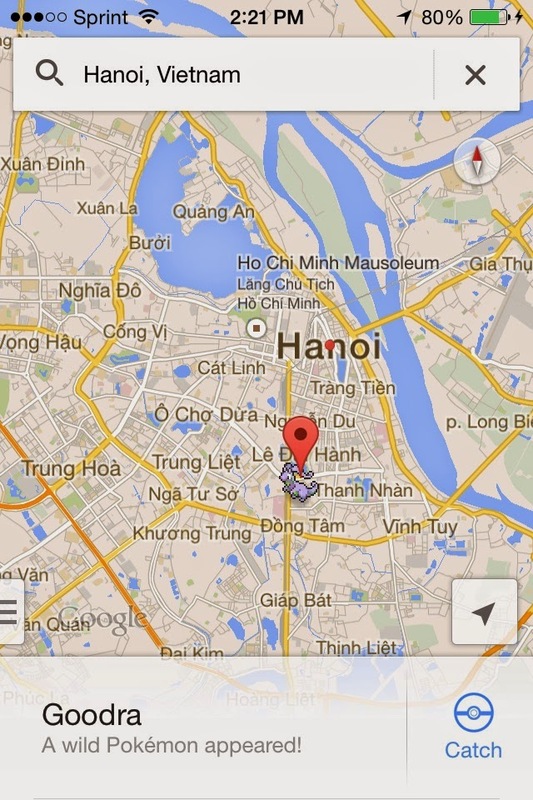 Meanwhile, I'm finding Pokémon on my phone as part of Google's April Fools prank. Pokémon in Vietnam? Yes!